These beauties were delivered with virtually zero hours playing time on them so I didn’t start comparisons until I was sure that the combo was well run-in. I gave both units more than 500 hours of repeat play, and during the biggest part of that time I heard very little change. It wasn’t until after around 400 hours that I started to hear the sound becoming darker, or rather, less bright. During the remaining part of the running in I heard less significant changes. 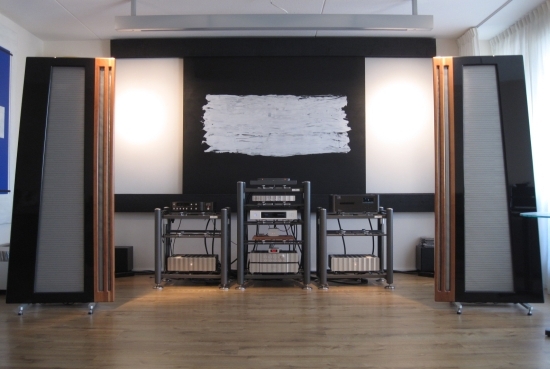 Mostly the sound became smoother and more relaxed, without losing any of its transparency or superbly natural timbre. All audio products evolve through time. Sometimes the sound develops in a direction that is generally liked by owners of the classic products, and sometimes it takes on a new direction, attracting new listeners in the process. This is of course a very personal matter. I am fond of the classic Rowland sound, and although I can appreciate the new direction Jeff has taken, I tend to stick with his classic equipment. 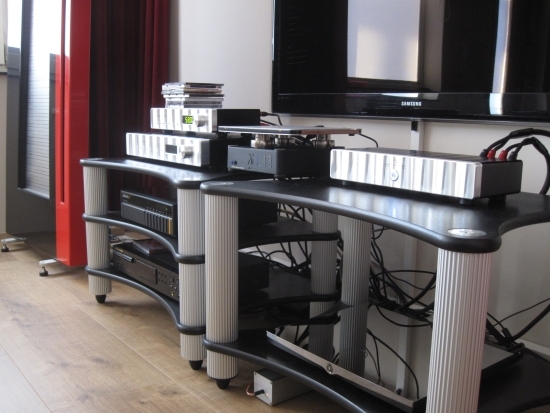 The Capri s2 and 125 combined, or by themselves, also provide a sound that deviates from the classic Rowland sound. But is that a bad thing? Regular readers know that I fell in love with the super-smooth, ultra-refined and slightly rose-tinted sound of Rowland’s classic components, but those components are almost 20 years old by now. There really is no point in comparing them any longer. Also, I must say that there is something to the new Rowland sound. I can relate to it, and I appreciate it, just for different reasons than I like the company’s old components. I do find however that the clearer, more transparent nature of the new Rowlands better matches speakers that have more inherent colouration. 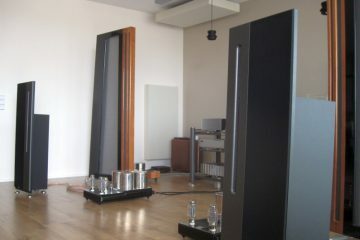 My past speakers such as Martin Logans as well as the Apogee and Magnepan ribbon speakers are all dipoles and therefore lack the typical cabinet-colourations. This is why these kinds of speakers tend to match better with more romantic sounding amplifiers, and this is why I still use components such as the Coherence, Concerto and model 6. 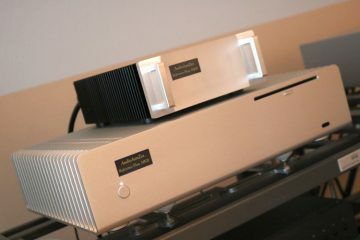 With proper component- and accessory matching however, the new Rowlands can sound utterly convincing too. What’s more: I think it’s fair to say that while the classic Rowlands typically sound more luxurious and romantic, the new Rowlands arguably sound more real. Not too long ago I reviewed the Rowland 525 by itself (without Capri). This amp utilizes new switching Pascal technology, whereas the Rowland 125 under review here utilizes the more familiar ICE Power technology. At the time I respected the 525’s power and transparency, but I felt that it wasn’t fluid enough for my taste. Treble in particular came across as being too square. Although I can’t rule out the possibility that the 525 hadn’t played enough, the virtually unused 125 was much more fluid even cold from the box, and with precious little hours played. It was also nicely smooth right from the get-go, but along with a top-to-bottom transparency that you don’t find often. So it appears that even if both amps are of the switching Class D sort, even if the amps have have a lot of common ground tonally, there still are marked differences in their sound. 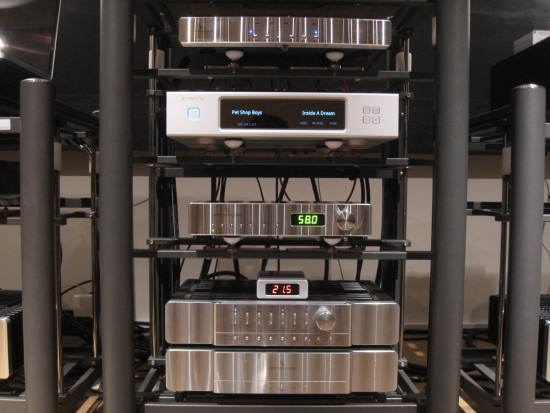 This just goes to show that there is more to amplifier sound than merely the components it’s made of. 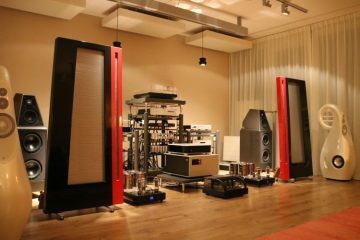 Recently I visited an audio show where I listened to the model 925’s combined with the Corus preamp playing with large Blumenhofer speakers. 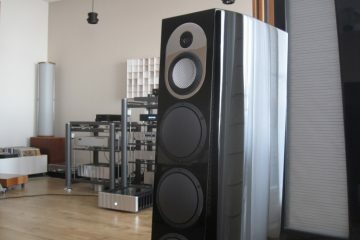 At the same show, I later heard the Continuum S2 with Raidho speakers. Even if these setups were very different from each other, not to mention from my own setup, I couldn’t help notice some similarities. In each event, the Rowlands produced a coherent, neutral yet natural, fast and transparent sound, without any harshness. This is when I started to feel more comfortable with the new, more neutral Rowland sound. Importantly, I also payed close attention to the Continuum’s resolution, which certainly wasn’t lacking here. Yet it also employs a Pascal-based poweramp. So is this a matter of system context? Was my 525 an exception, or did it simply need more time to run in? I can’t be sure now. The thing I wondered about most was how this neat duo would compare with a Devialet 120. 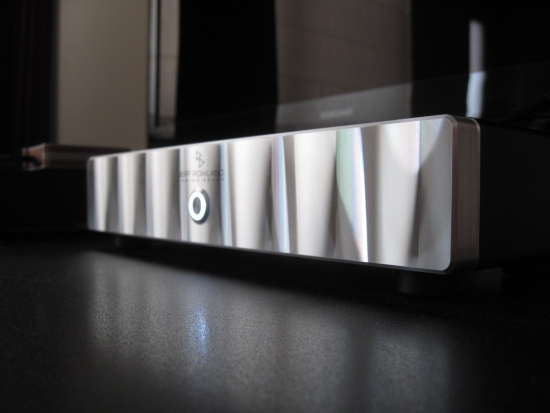 At the time of this review, the Devialet runs firmware 8.1.3. Please note that the sound of the Devialet can be changed considerably depending on the firmware loaded. For more info see this article. 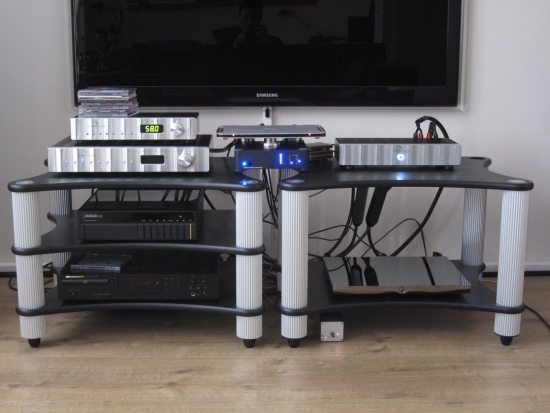 With the same AudioAanZee Reference Flow Music Server source, Belden powercables and AudioQuest Castle Rock speaker cables, the most obvious differences are that Rowland combo sounds livelier, with more punchy bass and an acoustically more convincing tonality than the Devialet. As any piece of equipment, the Capri and 125 also benefit from better cables, but they also sound in tune with standard cables. Ultimately I settled on a Transparent Ultra XL XLR between Capri and 125 (to make most of the fluidity while retaining timbre) and an Audioquest Water cinch interlink between DAC and Capri. 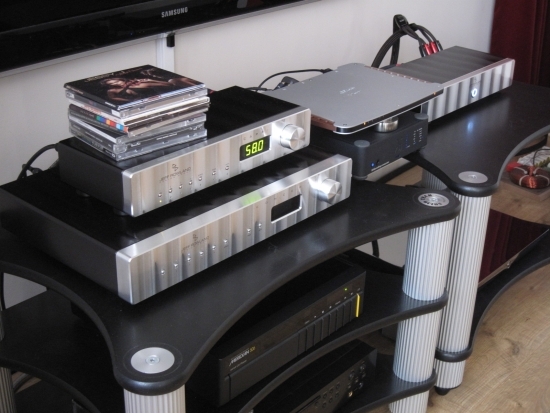 DACs used were the EC Designs Mosaic 16 and Wadia 121. Used this way, they deliver a more natural, more convincing midrange, mostly evident with grand piano, which sounds more “grand” and more wooden than with the Devialet. 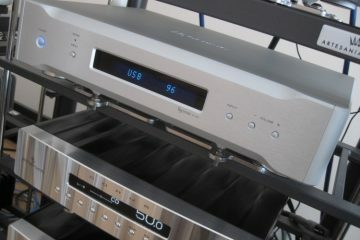 Above: Capri S2 on top of Concerto preamp. 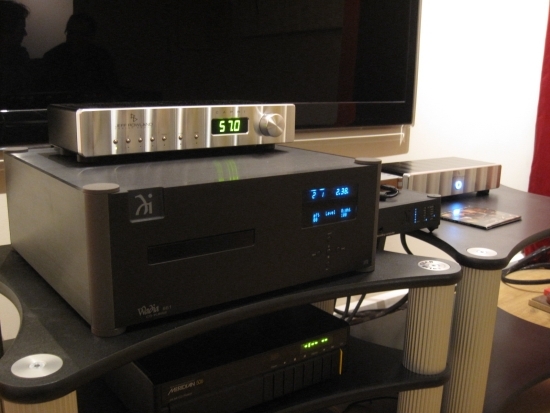 Between the Rowlands is a Wadia 121 DAC with an EC Designs Mosaic DAC on top. Bottom right is the Devialet 120. 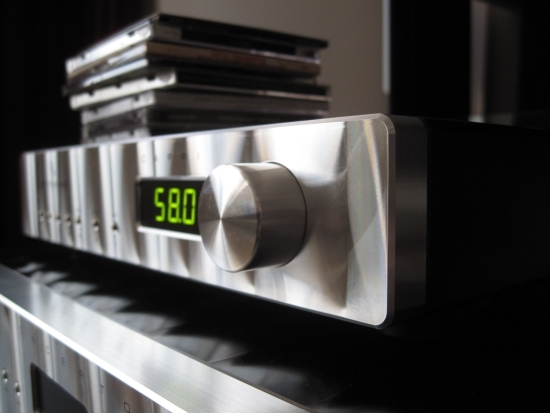 The Devialet however counters in resolution and fluidity. Ironically, the Devialet sounds more “classic” Rowland than do the actual two Rowland components sitting next to it. Even if the 125 sounds quite a bit more fluid and smooth than the 525, the 125 still doesn’t sound as fluid and airy as the older JRDG generation amps. Maybe this is an inherent quality of Class D’s switching nature, maybe it is by design. In any event this is where the Devialet’s hybrid Class A/Class D nature scores most points. Devialet also uses Class D, but only for providing current. The sine wave is wholly reproduced in Class A and this is most evident from the smoother, more fluid treble with more obvious, longer decay. With the Capri/125 treble is every bit as articulate, if not better than with the Devialet, but with the Apogee Duettas at least, it’s a little bit too silent inbetween the notes for my taste. The Devialet 120 has something of a dip in the midrange which partially explains its “warmer” sound, but this also makes for the feeling of a richer sound, making the Rowlands come across as more analytical sounding. They are likely simply more precise, but in my setup at least, this makes them emotionally less appealing. Soundstaging with the Rowlands is mostly concentrated in between the speakers. 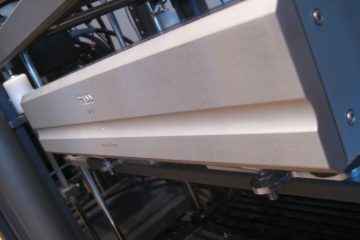 The Devialet by comparison is more expansive both in the width and depth plane, and has better layering. Above: interestingly, the characterful Wadia 861 CD player turned out to be a very good match, performing best of all sources at hand. The two units look great as a combo, even if, oddly the two are not exactly the same size: the Capri s2 is 15,5cm deep and the 125 is 15cm deep. This is something that I have seen more often with Rowland products. The Synergy preamp for example exhibits similar differences in depth between preamp and power supply sections and I have seen deviations in width with the Model 1 and Consonance. Knowing what’s important for Jeff in design, I’m guessing that this likely serves a purpose in avoiding resonances. Anyway, the combo looks great and works well together, but because the Capri s2 is the more pricey component of the two I was curious to find out how the Capri s2 would perform on its own in a more upscale system context. In my main setup I normally use a Coherence II preamp. For comparison, I positioned the Capri s2 directly above it, and connected it with the same cables. 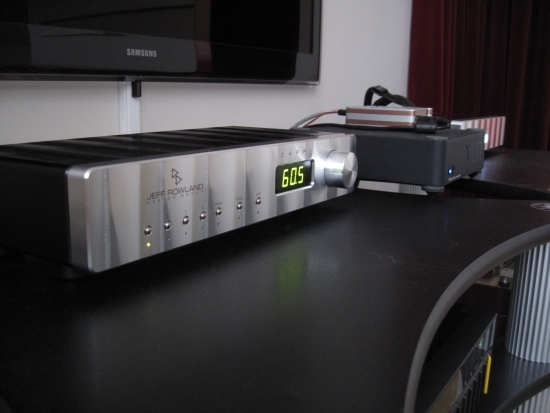 For source I used the Aurender N10 music server and Rowland Aeris DAC, connected via an Audioquest Diamond USB cable. 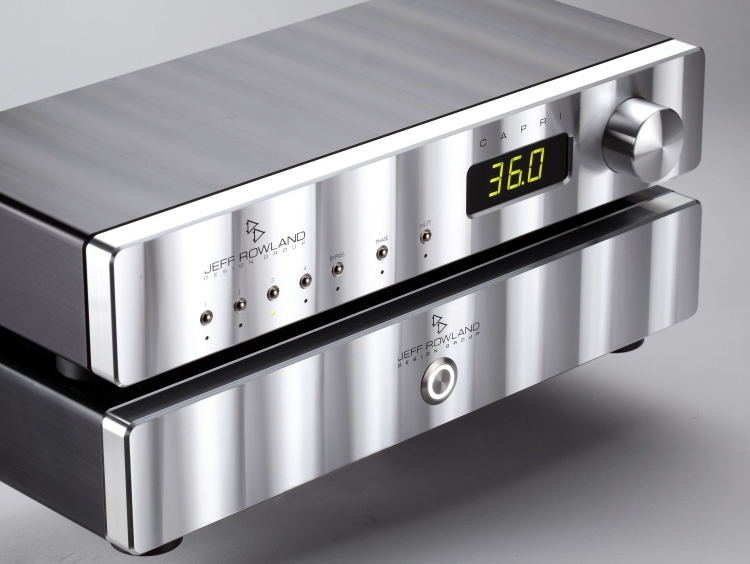 Because the new Rowland sound had started to grow on me after having listened to current more upscale Rowland products such as the Continuum, Corus, 725’s and 925’s, I expected a lot from the Capri s2. Sure the Capri would not sound similar to the very smooth and relaxed Coherence II but I definitely expected to be treated to superb transparency and impressive dynamics. Alas, not so. Dynamically the Capri 2s is not overly expressive, its sounstage is compact and transparency, while good, is not outstanding. In terms of microdetail my feeling is that I hear more, and more subtle sounds with the Coherence II (expensive former reference) or Concerto preamps (successor to the Synergy range and predecessor of the Capri range). Timbre is very good, and the sound definitely does not lack colour or substance, but there’s a certain silence or emptyness between the notes, that some people might associate positively as being a very black background, but for me verges away from the disired analog fluidity. I am at least not used to hearing this from Rowland equipment, the 525 excepted. Tube amplifiers are said to add harmonics (and distortion), and this is perceived as a fuller, more harmonious sound. For better of for worse, interpret this whichever way is felt true, the Capri sounds as the reverse of this phenomenon: as if harmonics have been taken out. Does it simply lack distortion? It’s only fair that the Coherence II, being a past top of the line preamp and being battery-fed, sounds fuller, but also the much more modern and at the time very affordable Concerto preamp sounds a lot fuller in the bass, richer overall and much more fluid. And while the Concerto sounds warmer than the Capri s2, this may be perceived as it being less transparent, but I actually find that I hear more low level detail with it than with the Capri s2. 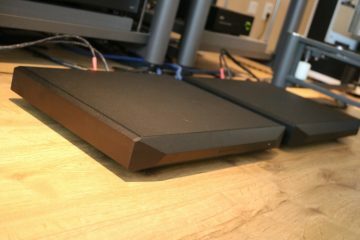 I might sound a bit harsh in my judgement above, and one could conclude that the Capri s2 is not a very good preamp, but on itself, it doesn’t really do anything wrong. It’s just that I’m used from Rowland preamps that they really stand out, and to me, the Capri s2 doesn’t. Just to be sure not to draw premature conclusions, I also listened to the Capri s2 in my friend JW’s system, to listen to for a while in place of his Synergy IIi in the Finite Elemente Spider rack. 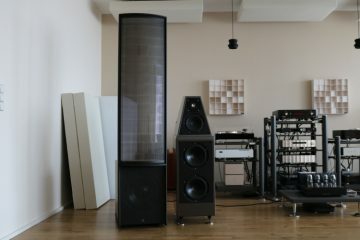 The other components are a Wadia 861 CD player, Rowland model 6 power amps and Apogee Duetta Signature speakers, connected with Transparent Reference interlinks and speaker cables. Power cable used for the Capri was the very musical Fusion Audio Romance. Alas, also in this context, the results were the same. In all fairness, JW’s Synergy is a very smooth sounding preamp, so much so that in some setups it just won’t sound well in the PRAT department, but when implemented with care, it sounds remarkably close to the Coherence II. Because the Capri is much more modern than the Synergy JW and I expected to hear tighter and more powerful bass, better transparency and a more dynamic sound. Ironically, none of the above was heard. The Capri does sound less velvety-smooth and romantic than the Synergy IIi, more neutral in fact, and for some this might well be the better balance. But we couldn’t help but feel disappointed. I need to stress that this isn’t merely a matter of us preferring the old Rowland sound and preferring more warmth and richness. Things like resolution and transparency were also well behind the levels reached by the Synergy. The Capri s2 also sounds dynamically, harmonically and dimensionally restrained and as a result it fails to deliver a “lyrical”, truly emotionally involving performance. I was hoping to hear a Corus-lite in the Capri s2, but while price-wise in a different category, the Corus really is in another league soundwise, too. The Rowland sound has been developing from an initially very creamy-smooth sound in the direction of a more transparent, higher resolving and more neutral sound. Thankfully there’s still that familiar un-agressive sense of a smooth, polished sound, for which I like Rowland products so much. Sure these days they have a more modern sound than the old product line, but the beauty is that I feel that the balance between smoothness and clear neutrality in the more upscale Rowland products is made just right. While I personally still lean more toward the classic sound, I can definitely appreciate the new direction. The new Rowland sound as evidenced not only in the Capri and 125, but also in the more upscale Corus, 725’s and all other current Rowland products, manages to combine superb neutrality and transparency with an utter lack of grain or hardness even when playing loudly. Importantly the Capri 2s/125 combo always avoids sounding analytical. If the one-word descriptor for the classic Rowland sound used to be “Romance”, it now is “Real”. Like the 525, the 125 has a timbrally correct, neutral and powerful delivery but it is smoother and more refined, and therefore, more likeable for me. Perhaps the 525 had a more powerful bass, but the 125 isn’t far off, and in any case if you want to improve on the 125 within the Rowland range, it will have to be the 625 and that amp is placed more than a few price levels up. In its price range, the 125 is a fine amp, one that is not easily beaten unless spending a lot more. 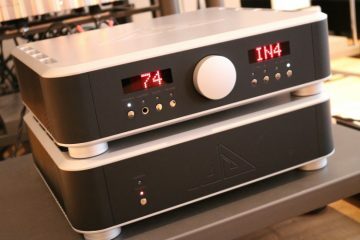 In absolute terms however it seems that the more affordable pure class D amps don’t provide the more sophisticated sound that can be attained by sticking with Class AB, as evidenced by the more upscale Rowland amplifiers such as the 625 and 725’s. Class D in itself need not be the problem though. The big and musical 925 power amps are evidence of this, but these fall in a very different price category. The Capri 2s doesn’t set a foot wrong. Its sins are not of commission, but rather of omission. It’s not that it sounds bad, but it just doesn’t sound exemplary in any single aspect, or as a whole. It’s a beautiful looking piece of equipment finished to a very high standard, but in this crowded market there are many rivals in this price range and while I cannot think of another preamp that looks this svelte, sound-wise there is some fierce competition. The Capri s2 + 125 are beautiful components to look at, they are not larger than the need to be but feel extremely solid and luxurious. Connectivity is more than adequate and operationally they are flawless, although the Capri’s plastic remote really is not laid out very well nor is it visually very pleasing. If you want to start your Rowland experience without breaking the bank, these are the perfect components. However, for the combined sum of 9000 euro, I feel that better sound can be had. For example the Devialet 120 at 5000 euro, sounds more refined and engaging, even if it is timbrally less convincing, and it includes a DAC and streaming endpoint. 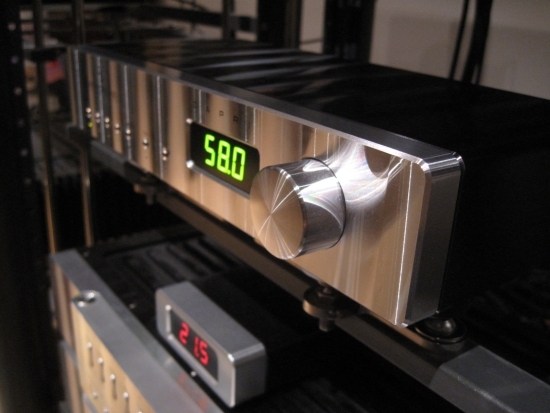 Another example is the Accuphase E260 integrated amplifier. 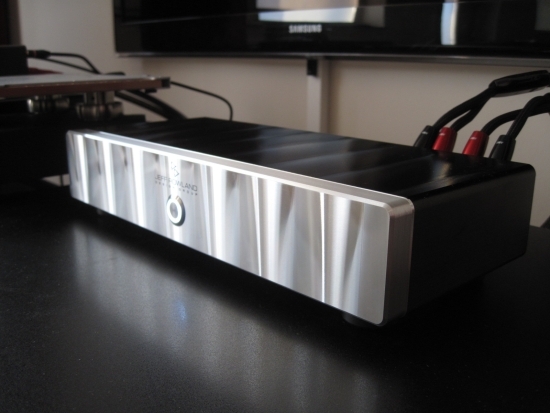 Adding the optional DAC board, at a total sum of 6350 euro this amp doesn’t provide all of the Devialet’s resolving power or treble air, but it sounds superbly engaging, adding an undefineable sense of musicality and being every bit as natural timbrally as the Rowland combo. 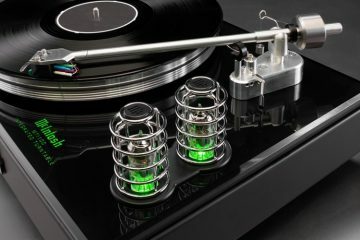 One can of course further improve on the Accupase and Devialet amps using more upscale JRDG products, but at higher cost. If funds allow, I would recommend going straight for the Corus and 625 s2, which are the pre-pro combo to beat. 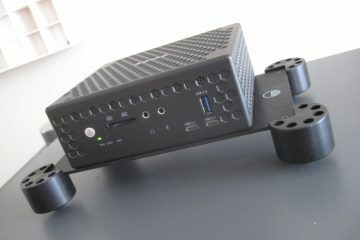 If that is too far a stretch, I have a feeling that the 12000 euro integrated Continuum is also something special. Above: although there are some older Rowlands with similar Cardas connectors that are hollow on the inside, the ones fitted on the 125 are solid. As such they will only accommodate spades. I wonder if you have heard the original Capri that was shipped with 102 amp, and would you compare it to Capri S2 or another preamp? I got the impression that maybe original Capri was a bit better. Alas – I only heard the Capri S2 but I know that there are often quite considerable differences between s1 and s2 JRDG products, and “best” is relative. Take the differences between Synergy 1, 2 and 2i for example. If you like very smooth and refined then the last iteration is best. If, however, you want the tightest and most ballsy sound, then the first iteration is best. So you liked 125 better than 102? I had 102 and it was so neutral, you could “hear” every interconnect or power cord through it. 125 should be a bit less neutral and bit more on the warm side. I wonder which power cords you used with it? Cardas Neutral Reference would sound like a good fit. Adding the Synergy 2/i to it would probably make a great little system, although maybe not a too-relaxed one, knowing the grip of 102 had on the speakers. I found that the 125 has a more natural timbre and more solid bass than the 102 and 201’s. It was sort of like a mix of the best aspects from Pascal and ICE power. But it also has the very tight “new” Rowland sound just like the Pascal 525 does, which deviates from their classic fluidity and smootness, which is also present to some extent in the 201’2 and the 102. Neutral, alas, still allows wiggle room for other aspects of sound, such as timbre which is something that I am often referring to. Not everyone is as sensitive to this but I find the 102 to sound somewhat synthetic even if it is indeed very neutral. I can’t recall the cables I used but I know this can make a large difference. 102’s or 201’s have my respect but I don’t love them, no matter the different system contexts that I tried them in. But then, the same goes for the 125. Of all Rowlands, I found the model sixes to have the best balance of virtues. After that, the 625 S2 is also very nice but admittedly in a very different price category. More natural timbre sounds better. Jeff Rowland 102 has almost synthetic timber wird stock power cord. But change it to a better entry level power cord like WW Stratus, and it becomes a lot of more natural and neutral. It shines with WW Silver Electra or Cardas Golden Reference (transparency, definition, speed). However it did not match completely with speakers i had at that time, 2/3 were perfect, bass-lines, vocals, but wooden instruments, flute, strings , were just washed-out. It was not a problem in the mids, otherwise vocals would suffer too. I later realised it is the speakers which had a metallic timbre so i got rid of them. So 102 should be better than 201 carefully matched (102 has bit newer ICE modules). Too bad that the Capri S2 is not that good, so one has to turn to olde Synergy models in this price class. 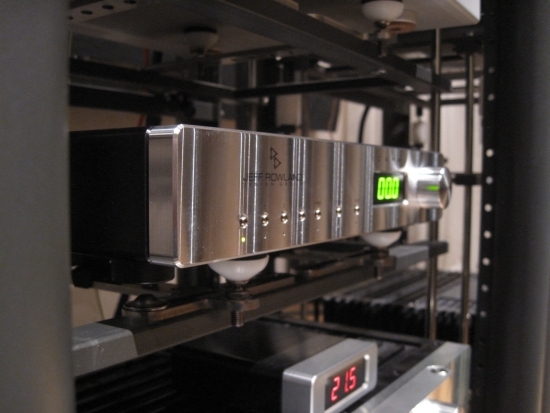 Allegedly Capri S2 was redesigned by somebody else than Jeff Rowland – as if he does not understand designing preamps. Hi Marek, You may be right but I’ve not heard that rumor – that someone other than Jeff has designed the Capri S2. Maybe he did get some ideas from someone (certain specialist op-amps) but I can’t imagine him outsourcing the design work to someone else. The only case that I am aware of where this is partially true is with the Aeris DAC but even then, he designed the analog parts. BTW the Capri s2 is actually thought by JRDG to be better than the Synergy 2i. And indeed it’s not that it is not good perse, but personally, I found it sounding static, not really living-and-breathing. Mainly it lacked that inviting flow that characterized earlier JRDG preamps and thus, it wasn’t a preamp that I would buy. 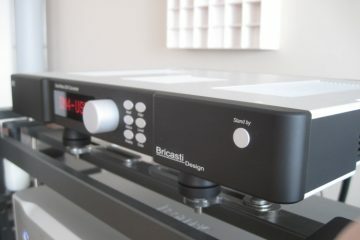 In the “affordable” price range, the Concerto preamp is actually a pretty interesting alternative to the Synergy. My personal taste and system synergy aside, it looks like JRDG are going through a change in house sound for some products. That said, Jeff has always said that he does not actually strive for any kind of house sound. Instead, he looks to produce the best amps he can, using the best components he can find at any time. http://alteraudio.fr/img/cms/2017/2017-JEFF-ROWLAND_CATALOGUE.pdf, so maybe he also was involved into Capri S2. Ah yes I forgot about Concerto, i read the articles on your site about it, but i think you described once as “grayish” compared to Synergy 2i. So i am not quite sure now, is it good or bad. I am also looking for more natural sounding components, this is why i am thinking about the Synergy 2/i. The Concerto is less organic and creamy-rich than the Synergy but I much prefer it to the Capri S2. I’d say that it has a good balance of virtues. The deciding factor is basically the impact and tightness of the bass (Concerto and Capri) versus smoothness and rich liquidity (Synergy). Hi Marek, I double checked with Jeff and as it turns out, Thomas Holm was indeed involved with the Capri S2 and Continuum S2. Jeff’s response can be read below. Thnx, this is what i thought. Not sure about Pascal amps like Continuum since i haven’t heard it yet. I would be more comfortable with 125 because it has the ICE which is known to me, and obviously ICE gets only better during the years (if you recall first Class D Rowland amps, even the 201, 102 had already newer ICE module and i could integrate the 102 it into my system so that it sounded superbly natural, I even tried the external PFC-LPSU, but it made the sound less dynamic and engaging. It turned out that the internal SPS really could deliver better). I think 125 amp and Synergy 2 should be a a very nice match. Hi Marek, I’ve only heard the Continuum once at a show with Raidho speakers. While the setup was unfamiliar, I noticed that the amp did not sound particularly “Pascal-y” to me at all (as the 525 did), it was rather natural actually. I understand that ICE is more familiar and I’d say that the 125 is a pretty safe bet, considering that it employs ICE power modules but has gained the natural timbre and bass solidity of the 525. Interesting to hear about the PFC unit as I have no personal experience with this. Indeed, the 125 should sound very nice when combined with the Synergy 2i. Synergy 2 is great as well, but less fluid and airy, less of that “Golden JRDG era-sound” which I think you are after. 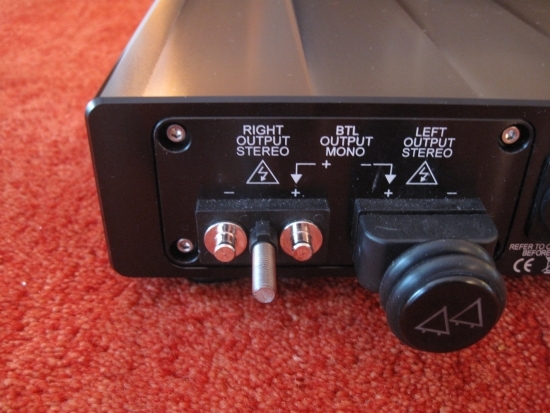 PS have you seen this article in which I compare a couple of switching amps? Yes i know this article and commented there already and my purchase of Model 102 was based on it partly. The 102 is extremely sensitive to cables – interconnects and power cable which is a good thing. However, It did not completely match with my speakers then, that were made for the older, classic warmer Rowland sound. I still think of it as very good amp. It just need tweaking and a bit less analytical/metallic speakers like mine at that time. Something like Sonus Faber would more suit to it probably. I checked out the Capri, the change in the sound compared to older Rowland preamps is most probably due to change from differential transformer-based sound to differential op amps used in Capri. The diff-transformers color the sound a bit, whereas the diff-opamp is more neutral. A friend of mine happened to use the same OPA in his DIY project for studio buffer like the ones Rowland used in Capri. They cost a few $, and he likes the sound a lot. Indeed, transformers add a certain subtle mellowness but that alone does not explain the differences between the Synergy and the Capri. I suspect that the power supply (linear versus switched) and op-amp type also have a lot to do with this. One more question since i see the Coherence II in this setup, did you try it with 125 amp? It should have sounded much better than with Capri S2? Hi Marek, TBH I can’t remember precisely. I did use the Coherence II and found it to sound sweeter, rounder and more free-flowing than the Capri but I’m not sure of my opinion of the 125 specifically in the Coherence-125 combo. I think I still preferred the 201’s to the 125 even with the CII for their more fluid delivery (even if they can sound more synthetic) but this is a bit speculative. Rather, I think that I was just not really satiasfied with switched amps at this point, which will explain why I did not go much beyond testing the 125 and the Capri as a combo. Long story short – i found a great offer for Capri & 102 and decided to order it! There is also a Concentra for only 1k€ currently for sale but i decided for Capri&102 also because of their low power because i want to listen to music in summer without warming up the whole room which would be with Concentra. Also Concentra uses lots of power according to your article, whereas Capri&102 are on the opposite side. Model 102 is a great little amp when using the right cables and speakers, and Capri should also be great according to one person ” it outperforms the older Concerto at least in the hearings I have done.